What is worth going waaaay over your budget to buy? Obviously, something that provides such intense pleasure that you are skipping with delight when you wear it a year later. In the moment, how do you decide to spend a great deal, relative to your means? I'm not talking about a purchase that is more or less manageable– I mean the tippy-top of your price point, plus 50%, plus every give-self-a-gift justification you can wrangle. Here are my criteria for clothes. We know the cost-per-wear concept, but in order to get that wear, search for something relatively undateable. Tweed hacking jacket trumps balloon skirt. To get a piece with legs, you need not confine yourself to stodgy, obdurate sensibility. 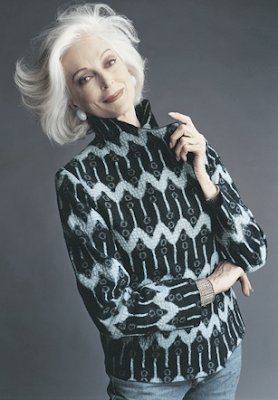 Your new sweater may not see 2020, but you want wear it out, not have it go out of style. This studded suede vest by Maje, ($390 from Net-a-porter) is a perfect example of hard-to-date. If you told me you'd had it since the '70s, I'd believe you, yet with a long-sleeved tee and jeans, it's of the moment. Philosophy di Alberta Feretti merlot satin jersey dress hits all my criteria: flattering cut, graceful fabric, and a belt to add in evening. Will travel well, too. Price, $640 from Net-a-porter. Here's a ringer, a Gaultier Paris-print kaftan. Some of the longest-wearing clothes are actually the wildest. Bonjour, inner Tabitha Getty? Auntie Mame? Or just a 50+ with a sense of humour. Price, $745 from Saks Fifth Avenue. Shown at the top of the post, Derek Lam's jade seamed wool tunic ($1,190 from Saks Fifth Avenue) is another item on which I'd make a decade bet. A '60s feel, but the shape (achieved though boning) and contrast seams add refinement. Look at the back detail! Though it sounds boring, I consider durability once the price zooms way beyond my comfort zone. No matter how much I think I'll wear those Italian velvet pants, the nap is going to wear off the seat in two seasons flat. Though fashion writers insist on calling him 'directional' (I always wonder which direction), Rick Owens' metallic leather jacket makes the cut. Chic casual leather is good place to put big bucks; wear makes a piece personal. Price, $2,260 from Net-a-porter. Do not remind me of my metallic brocade coat that cost as much as a small building and sprouted a forest of broken, stiff threads after one short season. A swath of understated luxury, this Bottega Veneta wool-gabardine trench in aubergine is mostly sold out on Net-a-porter (price, $1,950). Apparently I'm not alone in thinking, investment piece. Durability includes maintenance. Will it cause hand-wringing from cleaners? You know you're in trouble you hand over your white silk coat and hear "I can't promise...". Will you mind the continual cost for hand-pressing some blouses require? If you are over 50, require your splurge to accommodate a bit of weight gain (or loss, which I understand does happen to some women). A midriff-hugging delicate chiffon top may split its side seam and there's no room for alteration. Bye-bye. Matthew Williamson's embellished black silk maxi, with triangular mirror and metallic bead detail (price, $1,595 from Net-a-porter) is a smart splurge: multi-seasonal, forgiving and conducive to shortening to cocktail length one day, if you wish. Knits, especially wraps or sweaters which open, like cardi or jacket styles, provide some size flex. This Clements Ribeiro Breton-striped cashmere with bold ivory frogs would give a kick to simple pieces, and though memorable is also quite classic. Price, $1,375 from Net-a-porter. Ethnic or ethnic-inspired pieces in easy shapes that showcase superior textiles are also smart splurges. Shown, Japanese shirt from vintage indigo fabric by Asiatica, $1,995 (or hunt for textiles and have one made). Go with the flow. Etro's silk paisley caftan top does not require iron discipline to fit into over various summers. (Price, $590 from Net-a-porter). I realize there's another philosophy which is, buy a very close fitting, expensive garment and it motivates you to keep slim. Consignment shops are full of examples. A harder one to explain and control, this is an attitude issue. Will you let yourself wear and enjoy the item, as if it's your favourite J. Crew t-shirt? I've bought things so fabulous that they intimidated me. Sometimes I've gotten over it, but one silk blouse was so exquisite that I kept saving it, and ended up a bigger size before wearing it much. The opposite: a navy cashmere-silk sweater dress by Gentry Portofino that I bought in 1983. A monster splurge for me, yet the most timeless and enjoyable garment I've ever found. What are your criteria for a splurge? Besides stealing your heart, of course! What a wonderful post. My criteria is that simply nothing else will do. Oh, excellent post Duchesse! These days, anything that's an identifiable trend (e.g. 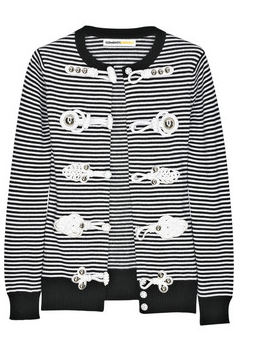 marching band jacket) is something I wouldn't splurge on, unless that trend really speaks to me (hello, marinieres!) and I know I'll wear long past trendiness. I'm really trying to sort out this question for myself now, and you've helped zoom in on the roadmap a bit. I LOVE that Paris print caftan top. Merveilleux! Just to add, a splurge must be something I have occasion to wear. 90% of my life is spent between work and home, so it must be something that I'd wear more than our once-a-month evening out. A really thought provoking post. All of your examples are clothes that I think most women would truly wear and enjoy. One criteria I use too, is, would I wear it every day if I had to? It's a harsh criteria, but when you invest a lot of money, I find it helps me really decide. Do you find that these pieces often never go on sale? Frequently, I find sale merchandise to be a jumble of trends, odd colours and unwearable shapes. Is this type of investment buy not worth waiting for the sales? I agree that it's worth the splurge if you can find a piece with a flattering cut that won't be dated . That Philosphy dress is a perfect example. I would splure for that. I splurged on the mother of the groom outfit...bought in 45 minutes...everything from the silk shantung wrap top to the shantung patchwork skirt, Swarovski crystal set mules and Debra Kay necklace...and a dainty shrug...and the cost came in at approximately $1500.00..... felt well put together, confident and current not dowdy....lovely daughter is not married so I have another splurge possibly in my future! Such a great post -- I so appreciate the way you and Pseu parse out your thinking so clearly on these issues. The splurges I've made in the last few years, I'm pleased to say, were successfuly because they fit one or other of these criteria. My F&B boots, bought on sale, half-price, at $500, get better-looking with each wear as they acquire that worn-leather look. As slightly military-inspired boots, they're between trend and classic, they're comfortable enough that I've walked miles and miles and miles in them, and they're versatile enough to wear with dresses, leggings, jeans, etc. My Burberry trench is obviously one of the timeless classic splurges, but mine is metallic silver -- so again classic but with a trend-twist that's not likely to date. My least practical, a Robert Rodriguez extravagantly patterned brocade high-waisted pleated skirt, strong colours, I just loved at first sight. Didn't buy it because it was too expensive for me (600? for a crazy skirt?). Then saw it on sale three months later in my size. I don't wear it more than a few times a year, but I love it enough that I know I will wear it ten years from now -- it's somehow beyond trend/fashion in its extravagance, as with the Gaultier kaftan you show. Again, such a great post, a nice follow-up to LPC's the other day. We have to buy clothes that are not simply timeless, but timeless for US and our own personal style. For Vivienne, it might be the "classic" pirate boot, but not for Pseu, who would consider it a one season wonder. I am so angry that my new VERY expensive Cavalli, Made In Italy shades, popped a gasket. You never seem to be able to tell what's really worth it until you have it and enjoy it for a long while, sort of like a marriage! I have bought precious few "luxury" items in my life. It seems to me that fine jewelry is never a regret. I would pay a fortune for the right Westwood, McQueen, Dolce or Versace jacket. Or the ONE THING that best expressed my essence. The one thing that if left in an attic trunk and discovered when I am gone, that would eloquently tell the finder just who I WAS. A splurge. Interesting. My splurging means buying something unique and beautiful. Not necessarily clothing. Maybe I would splurge on art per moment. Splurgie: Nice one, wish I was that certain. Christine: I'll adopt your 'wear it everyday?' criterion, thanks! Agree that gems rarely make it to the sale rack. Belle: Perfect neckline for jewelry! hostess: You were lucky to find everything at once! materfamilias: Sounds like you've got this down! Karen: "Trunk in the attic" is such an imaginative criterion! LOL about marriage and COL about those sunglasses. metscan: Yes, one can spurge on anything; my purpose in this post was to discuss solely clothes. Duchesse, I just love the way you think. I have been pondering this very issue myself. So far my conclusion is that an item is splurge worthy if I connect with it on a feeling level. That's a strange statement regarding clothing but it works for me. I must find beauty in the garment almost as an individual piece of art as well as how it feels on my body. The item must inspire me to bring out the best in myself. Does it inspire me to live from the place of the interesting, unique woman that I am? This is all very subjective I realize but this feeling usually leads me towards timeless cuts in rich tones and fabrics; usually in fall/winter clothing, rarely in spring summer. Ok. Let it be clothes then. I splurge on beautiful lingerie, does that count? The past winter I splurged on the fur stole. LaurieAnn: I'm appreciating how that beacon leads you so accurately. Your point about fall/winter is instructive too. My most recent big purchase was a cashmere jacket. metscan: A fur stole is definitely a splurge for just about all of us! What a great post! I love your guidelines. And Pseu's point about it being something one will actually wear is an important one. I am feeling emboldened to splurge on a camel cashmere coat that I have been stalking. Boots and winter coats. As for other items--I can hardly predict what I will wear to death. Thanks Duchesse for your exciting email. I forwarded it to my daughter. Often what makes me feel like splurging on something is if the fabric is wonderful. That's really important to me. Aunt Snow: Hi there, in your new name! Fabric defniitely draws me too, and the really special fabrics are costly. And that is when the serious envy of our seamstress bloggers sets in. Oh NO! My verification word, "Udegeyri"- you de Geri!